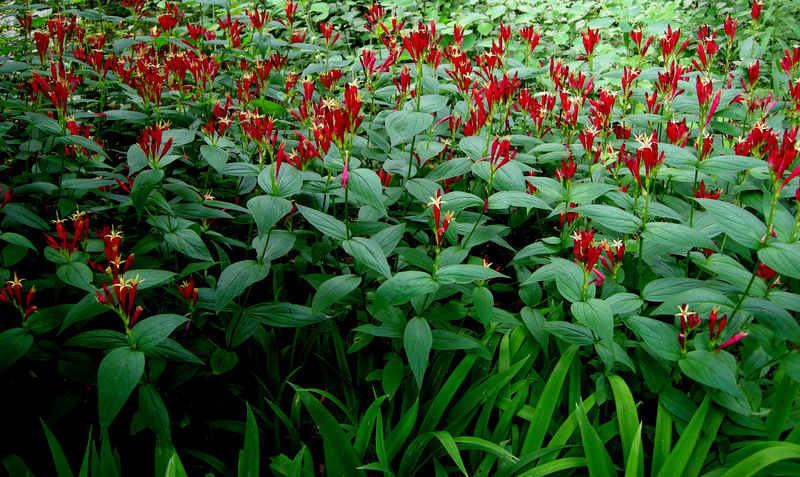 My efforts to establish native Indian pink, Spigelia marilandica, have really paid off. Nevertheless, I covet this six-year-old stand at Chanticleer. In my articles My Thanksgiving Oak Forest and Supporting Sustainable Living: Part One, I explained that sustainable living is very important to me, and I have supported it through planting and promoting native plants like the Indian pink pictured above, gardening organically, not watering, replenishing the soil, composting, eliminating lawn, and initiating and running an invasive plant removal program, among other activities. I also explained that I am uniquely placed to have a wider impact through my interactions with gardeners at my nursery. The check in table at the Conservancy event. 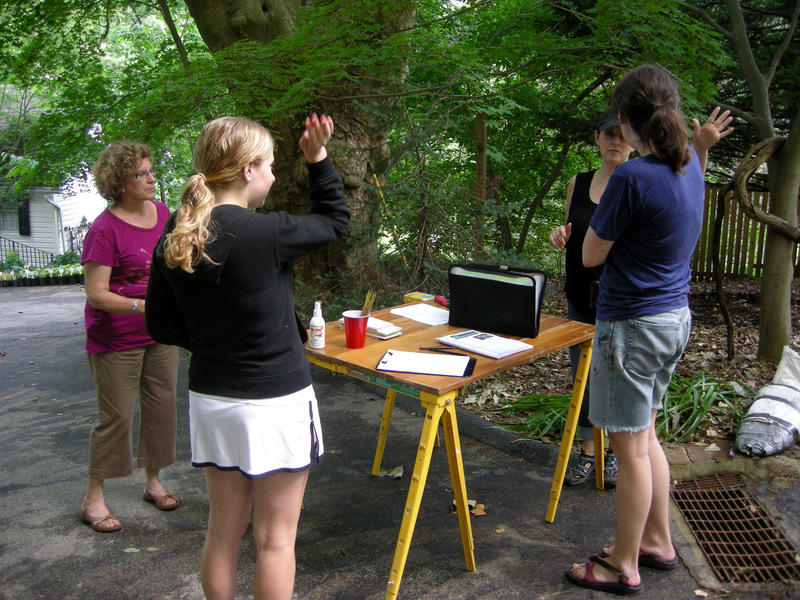 These young women came specifically to talk with the Lyme disease expert. 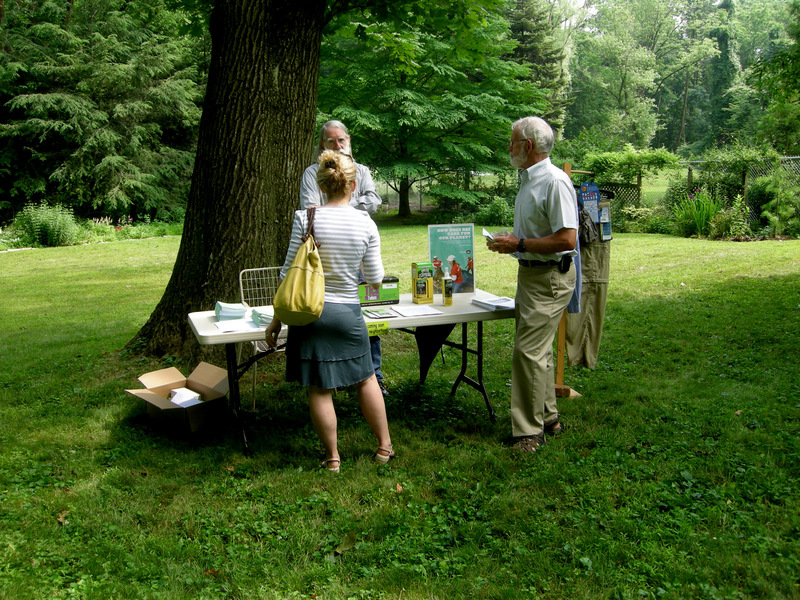 In my article Powered By Compost, I described a composting event to be held at my nursery sponsored by the Radnor Conservancy (dedicated to the preservation of open space) to raise township residents’ awareness of the magical powers of compost. Reader response to this article was very high so I thought everyone might like to find out how the event went. 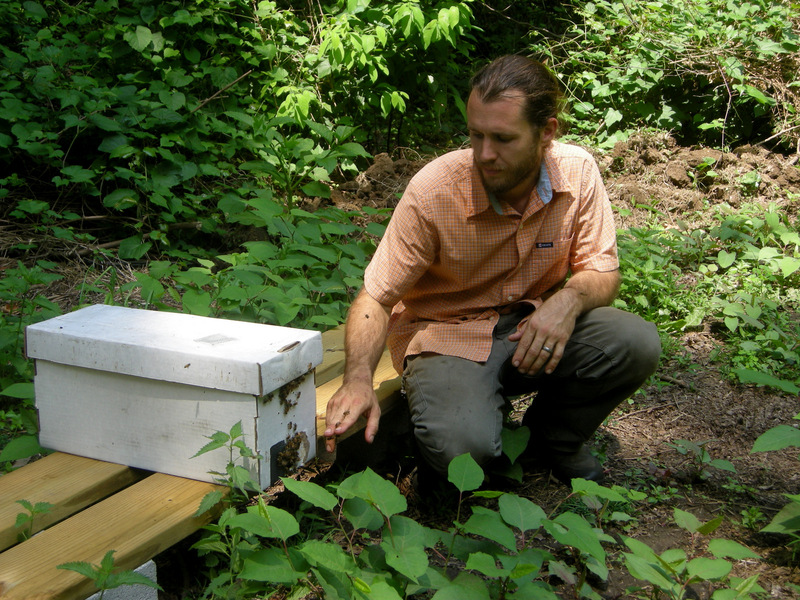 I also wanted to highlight my latest venture into sustainability–honeybees. 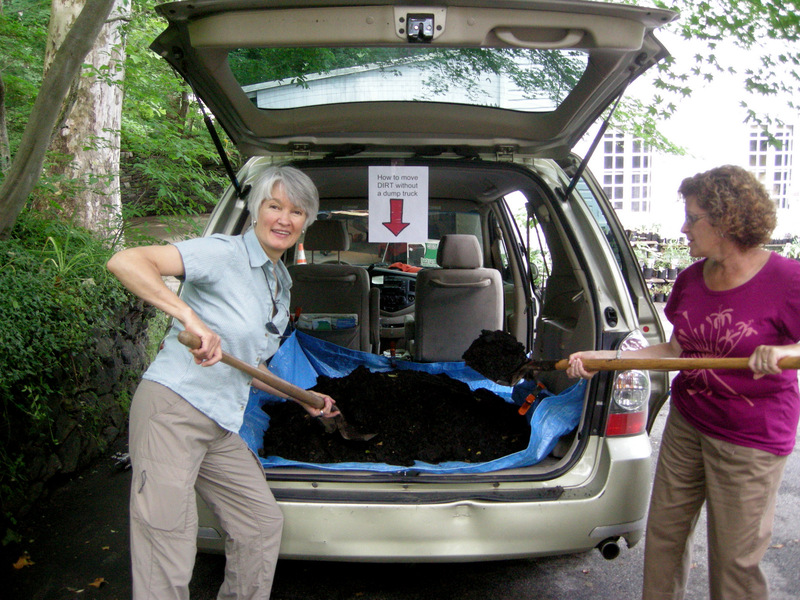 Event organizers demonstrate loading compost into a minivan. The vehicle is protected from the compost by a blue tarp (how could we function without those?) attached to the side of the van with large orange wood clamps. There was a lot of interest in the Conservancy’s method of transporting compost. 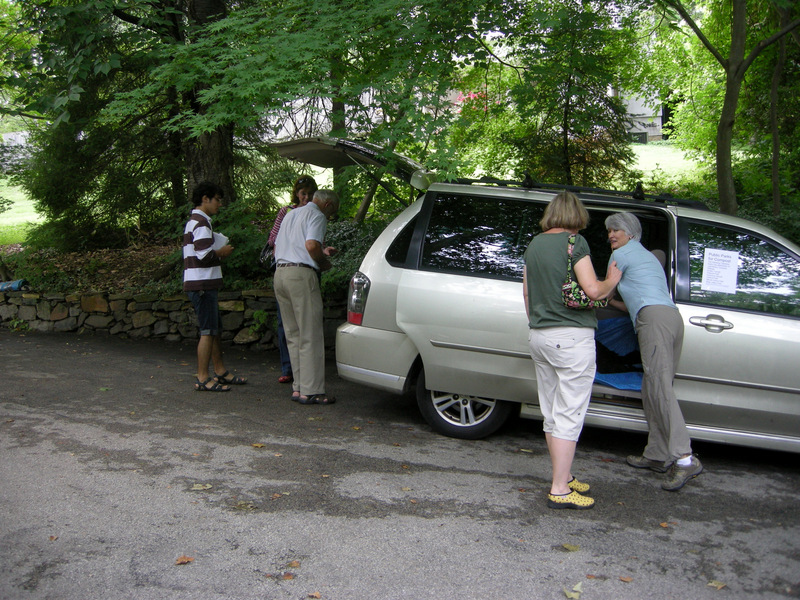 Penn State Master Gardeners under the carport of our carriage house explaining bin composting. 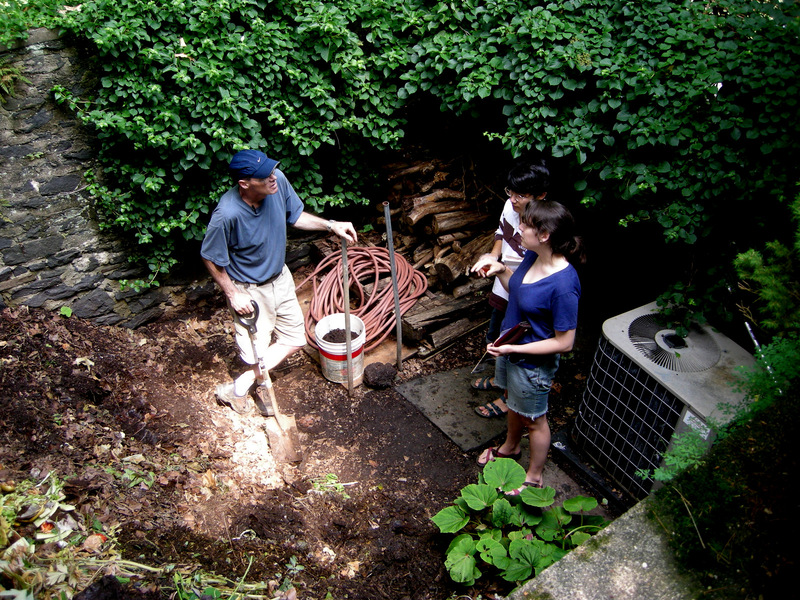 Michael explains that composting does not have to be complicated to another set of interested attendees. Doug Fearn explaining various Lyme disease prevention techniques. A fun and informative afternoon was had by all! 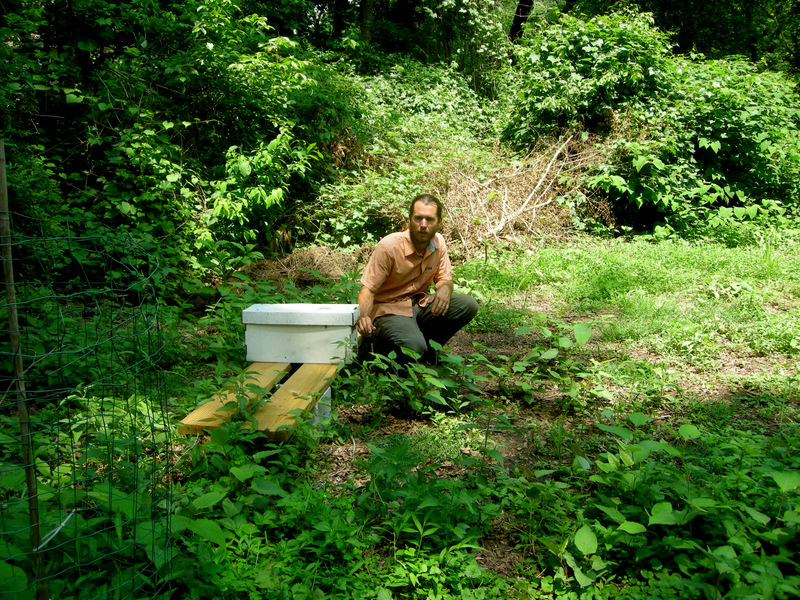 Trey Flemming from Two Gander Farm and the Bryn Mawr Farmer’s Market places the first hive at Carolyn’s Shade Gardens. The other “sustainable” event at Carolyn’s Shade Gardens lately was the arrival of the first hive of honeybees. I have been trying unsuccessfully for quite a while to convince Michael that beekeeping was in his future. Knowing when to pick up my marbles and go home, I switched my efforts to finding a local beekeeper who might want to place hives at Carolyn’s Shade Gardens. This spring I sold plants at my town’s growers’ farmer’s market, the Bryn Mawr Farmer’s Market, and met Trey Flemming, a beekeeper and farmer from Two Gander Farm in Fleetwood, Pennsylvania. Trey demonstrates the docility of his bees. I purchased some delicious honey that Trey produces from an invasive nonnative plant that I constantly battle, Japanese knotweed. Having a quarter acre of this noxious invader, I thought Trey might be interested in placing some hives here, and he was. This week the first of three hives arrived. Trey will market this honey at the Bryn Mawr Farmer’s Market as local Bryn Mawr honey, and I will receive five pounds of honey and the gratification of supporting a local farmer: a win, win situation if there ever was one! 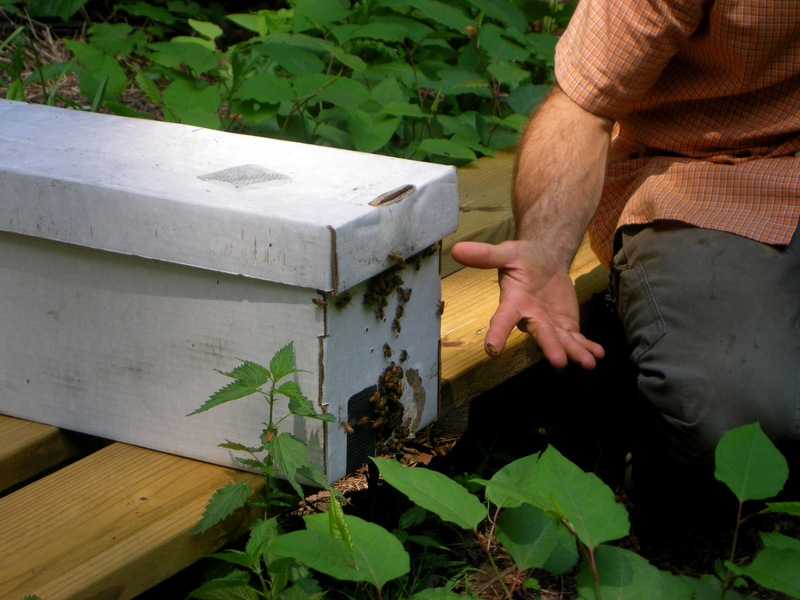 The bees crawl in and out of the hive and over Trey’s hand with their future nectar source, Japanese knotweed, in the foreground. I am so thrilled to be given the opportunity to support the Radnor Conservancy, composting, and a local farmer. It just takes the accumulation of small efforts by each of us to contribute to sustainable living in a big way. 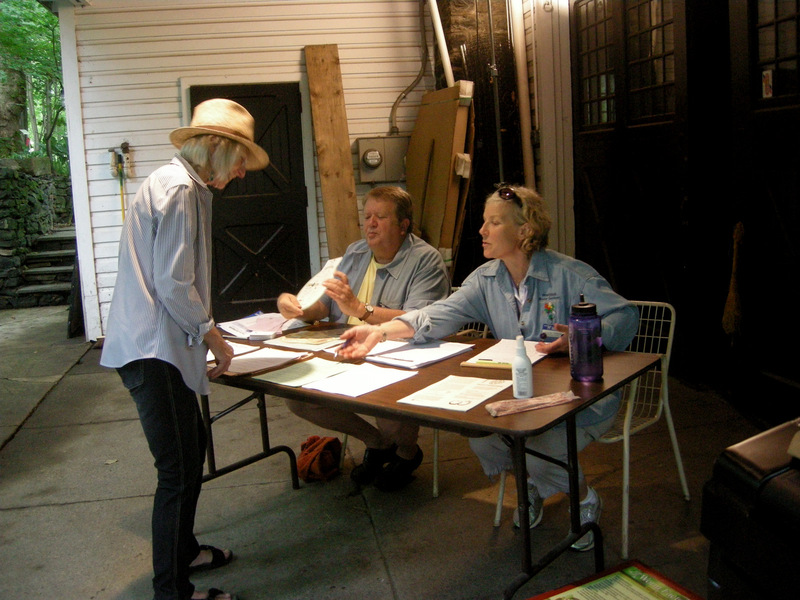 This entry was posted on June 21, 2011 at 7:06 am and is filed under green gardening, organic gardening, sustainable living with tags beekeeping, Bryn Mawr Farmer's Market, composting, honeybees, Radnor Conservancy event. You can follow any responses to this entry through the RSS 2.0 feed. You can leave a response, or trackback from your own site. Carolyn, every time I read your blog, I wish I lived closer so I could visit your gardens and attend the events! Off to work this morning, but I had to read your post. I had my horses boarded in Fleetwood for a time. It is a nice community. It is wonderful you now have bees and someone to maintain them. The Radnor event looked like a real success and all had a learning experience and some fun. Carolyn, thanks for doing your part and for hosting this event. I’m sure it was a real blessing to you and Micheal. g.
This looks like a great event, I wish I lived closer! What a delightful win-win situation……allowing your garden to be a home for the honeybees. I suspect there are more of these situations than one would imagine. I wonder if there’s something unique about gardens that fosters that sort of shared benefit. 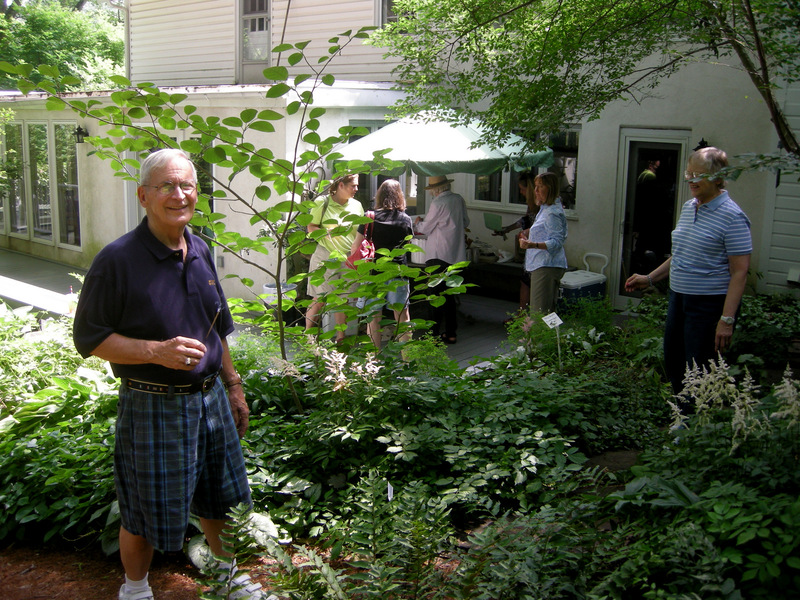 Having organized a garden tour this spring in Northwest Philadelphia, I realize that both the visitors and the hosts were excited by what the others offered. And when the hosts got together, there was yet more win-win bonus connections made! Love to hear about all the great initiatives in your garden and neck of the woods. I love honey bees!!! I know these guests will be very happy in your yard. In fact, I belong to the great sunflower project: http://www.greatsunflower.org/. It’s a great way to spend some time in the garden!!!! Congrats on a well done event at your nursery! It looks like fun. I too think Lyme disease is a big deal-all those tick bites can’t be good. Caroline – Just wondering if the bees would make the knotweed problem worse, because they would be pollinating them and helping them make seeds ? I think we’d go broke here if we didn’t make our own compost. Organic fertilizers are expensive, and honestly, I don’t find they tend to work as well in most instances. I hate Lyme disease, I’m sorry Michael has had to battle it. We have a lot ticks here, and at least once or twice a year one sneaks past me and gets sent in for testing. I’m glad Trey is setting up his hives there. I know your gardens will be good for the bees, and I’m sure the bees will be good for the gardens too. I’ll be curious to see if you notice much difference around the garden with the bees there. I wonder how many people came just for the homemade brownies, cookies , and mint iced tea! It sounds like a great event. I am sure people learned a lot and hopefully they will be inspired to practice sustainable living in their own homes and gardens. Good luck with your bees! I’m glad to know that even an obnoxious weed can be put to good use. For every thing there is a purpose! Sounds like a great event – and I look forward to hearing about your first honey tasting! What a great day! I love the compost. When people like you educate others about sustainable living it has an impact. They look to you for gardening guidance and are more likely to take on some of those tasks. Look likr a fun and interesting activity….very informative too! Carolyn, what a wonderful event that looks like. So much information and fun for everyone. I’m particularly excited to see that you found a beekeeper looking for a place to house bees. I’m very interested in bee keeping but don’t think it’s really feasible due to lack of time. Nice to know there’s the possibility that a co-operative situation is possible. Hey – looks like it was a beautiful and successful day! Congratulations! I hope one day to be able to tour your gardens and compost pit myself. He’s got lots of great photos and info. My heart goes out to Michael. I have a friend who has dealt with Lyme’s and was very shocking and sobering to see all that he has gone through. I spend a lot of time hiking and lived in Wisconsin for many years, so I’ve become hyper-vigilant regarding ticks. It’s great that the composting event also included getting the word out about ticks and Lyme’s disease. Hi Carolyn, I would love to have a hive of bees in my garden in exchange for honey. What a great arrangement ! Well done you! For many reasons. I tried my luck with a few Spigella plants and between the weather and the rabbits none survive. If I can find the plant again I will try once more. Love the beekeeping project! It’s nice that you at least found a use for your invasive plants. 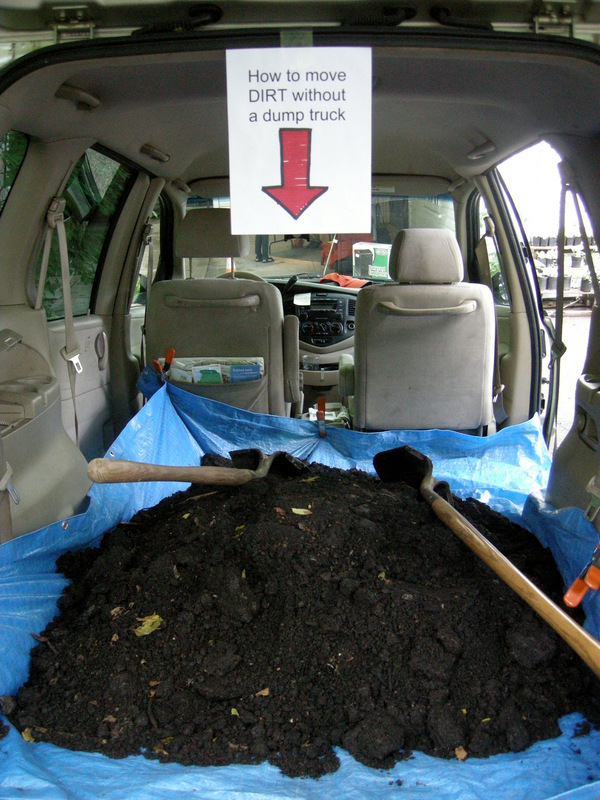 Also, great tips with the no-truck compost moving, too. I am often truck-less and will have to keep it in mind (though I admit to being spoiled by borrowing a friend’s large pickup with an automatic dumping bed). Another wonderful post, Carolyn! We struggle with knotweed here too, plus loosestrife. Invasive plants are making me nutty these days. But I am interested in the composting as well — we have been very lazy about appropriately turning and mixing our compost and as a result, things aren’t working very well. We finally agreed that we need to research a bit and once we get back from vacation in a couple of weeks, that will be our new priority. Lyme is epidemic in New England and we live in one of the epicenters. We deal with it here all the time, and even here, the diagnosis gets missed all the time. It’s so frustrating! As for the bees, good for you! Our vet has bees and she had a hard time finding farmers close to her who would allow her apiaries in their orchards! We have a neighbor who has bees and her bees visit every day. They have never stung anyone. She gave us a jar of honey a couple of years ago and we could definitely taste the lavender! Like others have said, I wish we lived closer! Speaking as someone who lives “downstream” from you at the other end of the Chesapeake, we appreciate your efforts. I just wish my own state would take things up a notch or two to be more like MD and PA when it comes to such things. At my job, I am also situated to help people make better choices when it comes to gardening. I am constantly amused and often stupified by some people’s lack of environmental responsibility and the notions they have about in regards to gardening. I love your spigellia! I’ve had a lot of success with it and have a nice patch near my backberries. It’s so awesome that your supporting hives! My aunt lives quite close to your nursery. Perhaps in the fall I’ll come up and we can visit. That would be a real treat!! I have always wondered why it seems all tarps are blue. And this is an ingenious way to get compost. My prius would be proud, I think. You are doing sucha an amazing work by showing how good it is to run a sustainable nursery. I reall y wish to visit you sometime! I am learning from you when for my soon to have garden.